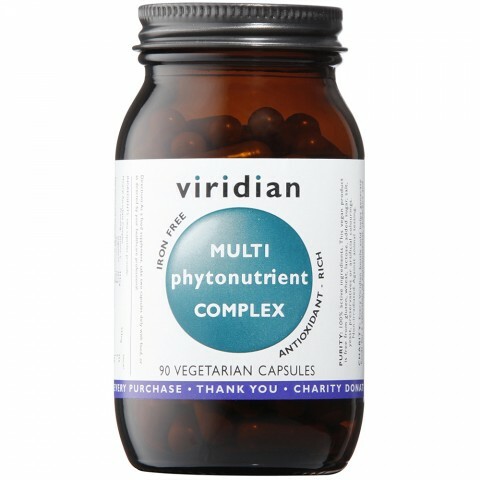 MultiPhytoNutrient Complex is formulated to include optimum amounts and presentations of the best quality vitamins, minerals, co-factors and plant extracts. This is a two-a-day supplement. Vitamin C plays an essential role in numerous areas of human health. Vitamin C contributes to normal collagen formation for the normal function of bones, cartilage, skin, gums and teeth. Vitamin C also enhances iron absorption and the normal energy-yielding metabolism. Vitamin C aids in the maintenance of the immune system including during and after intense physical exercise. Vitamin C contributes to normal psychological function, the functioning of the nervous system and contributes to the protection of cells from oxidative stress. This 'oxidative stress' appears to be a major factor in many human diseases. Vitamin D contributes to the maintenance of normal bones, teeth, muscle function and immune function. MultiPhytoNutrient Complex is iron free. Mineral Ascorbate Complex providing: Vitamin C 444mg/Magnesium 20mg/Calcium 10mg/Zinc 15mg 533mg, Pantothenic acid (Vitamin B5 as calcium pantothenate) 150mg, 95% Proanthocyanidin Complex providing;Grape seed extract 120mg/Pine bark extract 25mg 145mg, Carotenoid Complex (as D.salina algae) providing:Beta Carotene 6mg/Alpha Carotene 189ug/Cryptoxanthin 46ug/Zeaxcanthin 38ug/Lutein 30ug 80mg, Sulphur Amino Acid Complex providing:L-Cysteine 20mg/L-Methionine 20mg/L-Glutathione(reduced) 10mg 50mg, Green tea extract (95% polyphenols,min 70% catechins) 50mg, Niacin (Vitamin B3 as niacinamide) 50mg, MCT (Medium chain triglycerides) 50mg, Thiamin (Vitamin B1 as HCI) 25mg, Vitamin B6 (pyridoxine HCI) 25mg, Riboflavin (Vitamin B2) 25mg, PABA (para amino benzoic acid) 25mg, Alpha lipoic acid 20mg, Co-Q10 20mg, Selenium (selenomethionine) 200ug, Bromelain 10mg, Quercetin 10mg, Acerola 10mg, Manganese (bisglycinate) 1mg, Inositol 5mg, Choline (bitartrate) 5mg, Boron (sodium citrate) 500ug, Copper (citrate) 1mg, Chromium (picolinate) 200ug, Vitamin D2 (ergocalciferol - vegan) 1.25ug, Folic acid (folacin) 400ug, Vitamin K 50ug, Molybdenum (ammonium molybdate) 50ug, Vitamin B12 (cyanocobalamin) 50ug, Biotin 50ug, in a base of alfalfa, spirulina and bilberry.